Sadly, Mr. Malkin died of cancer in April, 1997 at the age of 33. Six months after Malkin died, a group of classical music lovers and musicians, all of whom lived in Columbia or elsewhere in Howard County, gathered to discuss forming a new chamber music organization to continue what he had begun. Sundays At Three was the product of that effort. One of its founders, Rev. James Shields, the Rector of Christ Episcopal Church in Columbia at that time, was elected its president. He offered to rent the church sanctuary to Sundays At Three for its concerts. The sanctuary is a two-story room with a balcony, an abundance of natural light, and wonderful acoustics – an excellent setting for chamber music. 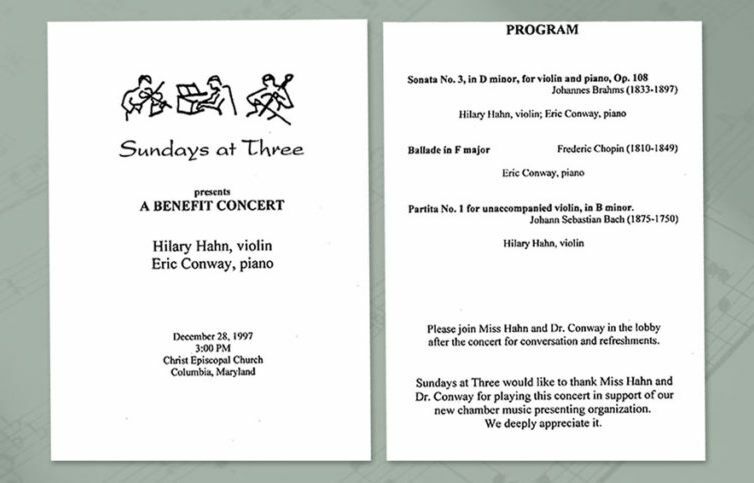 The first Sundays At Three concert, a fundraiser, took place on December 28, 1997. The program featured 18 year-old Hilary Hahn, who had already established herself as one of the most promising young violinists in the world. She performed with pianist Eric Conway, who is currently the Director of the Morgan State University Choir and Chairperson of the Fine Arts Department. The Sundays At Three board is not only its governing body, but the group of volunteers who do the work required to plan and present each concert.